Cook bacon in the oven until it is crispy on the outsides but still chewy in the center. Place bacon on paper towel to remove some of the rendering. Place cooked bacon in a glass jar with two 750 ml bottles of St-Germain and allow it to infuse for 24 hours at room temperature. Place liqueur in the freezer so renderings congeal and you can remove them. Strain through a fine mesh strainer and cheese cloth to remove as much rendering as possible. Repeat freezer step if needed and strain again. Combine bourbon, bacon-infused St-Germain, lemon juice, diluted maple syrup, bitters, and egg white into a mixing glass and shake vigorously with ice. Strain over fresh ice into a double-old fashioned glass. 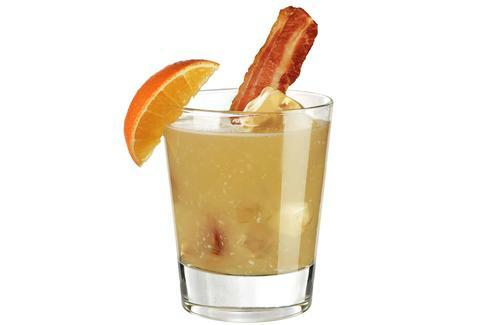 Garnish with an orange slice and a piece of the St-Germain-infused Applewood smoked bacon.